Tantalum capacitors have a Tantalum oxide dielectric which is a rare earth element and is mined in developing countries. Due to the rarity of this element tantalum capacitors are more expensive than electrolytics although superior. The tantalum market became quite vulnerable to supply problems and shortages with the increased demand from electronics manufacturers and therefore too high prices resulted on occasion. This led designers to switch away from making designs which used tantalum capacitors and instead use ceramic and electrolytic caps. So whilst older hardware used these capacitors they are more rare on newer computer hardware but I still find them in servers and networking hardware sometimes probably because of their reliability. Some newer hardware also requires high frequency switching voltage regulation (above 100kHz). Ceramic capacitors have superior characteristics than tantalum at high frequencies. 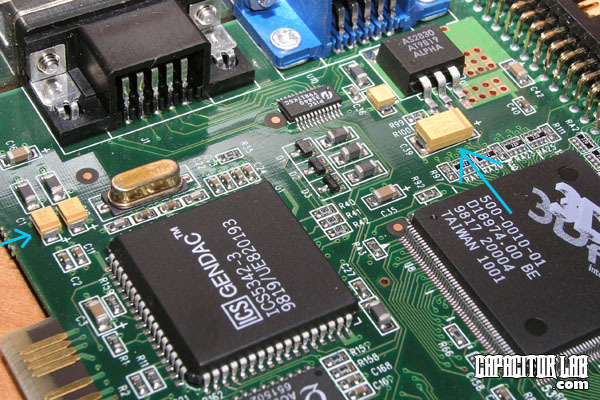 Tantalum capacitors are very sensitive to voltage spikes which exceed their rating. They will be destroyed very quickly if that occurs. If we take a look at a Tantalum capacitor we can see that it has a orange line at one side. This indicates the positive lead which is contrary to electrolytic capacitors which have a mark to indicate the negative lead. How confusing. On the PCB we see that the position has a + sign where this orange mark should be aligned. Tantalum capacitors are very sensitive to receiving reverse voltage. If they are connected backwards they willl blow violently very quickly.